Text in the above image: "In an effort to help the national debt, Taco Bell is pleased to announce that we have agreed to purchase the Liberty Bell, one of our country's most historic treasures. It will now be called the 'Taco Liberty Bell' and will still be accessible to the American public for viewing. While some may find this controversial, we hope our move will prompt other corporations to take similar action to do their part to reduce the country's debt." 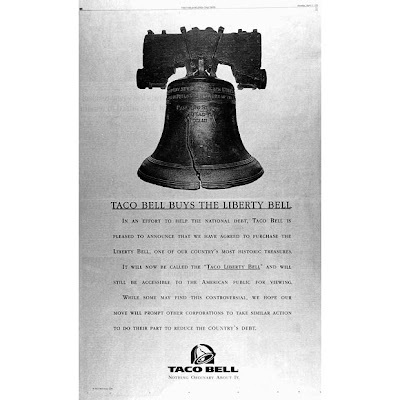 did anyone notice the ad in the april 1st inky about the liberty bell being bought by taco bell, and being known as the taco liberty bell from now on?? my tv watching friends tell me it was all over the news, and that the park service was all pissed off about it - tee hee. i thought it was a pretty good april fool's joke. i was really surprised that the taco bell corporate mucketymucks had that much of a sense of humor. anyone have any opinion on this? 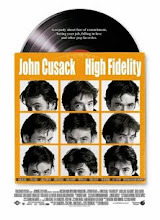 I remember seeing the ad in the newspaper and thinking that it was hilarious. Not being a big TV watcher, I failed to realize that so many people took it seriously until it became the hot topic of discussion at work and all of my friends started discussing the "controversy." As you can see from the phl.media thread, the people I associated with at the time all seemed to think it was funny, obviously a joke, etc - and that people who didn't quite see it that way needed to undergo a craniorectal inversion. I obviously agreed with them. Mark Costello commented that he thought the ad was timely due to the way our society is. I remember being distressed when Candlestick Park became 3com Park, which I believe was shortly before or around the same time as the Taco Liberty Bell stunt. Today we have Lincoln Financial Field (at least "the Linc" is an ok name), the Wachovia Center, and Citizen's Bank Park. Oy vey. I'd rather have the Taco Liberty Bell, at least that has some vague etymological connection, and is kind of funny! I wonder if we could actually get Taco Bell to sponsor the Liberty Bell, and if so, how many Philly taxpayers would be in favor of that if it would keep the libraries and swimming pools open for another five years? I am also willing to become the Taco Bell Animal Hospital, if Taco Bell would make it worth my while, and give me a discretionary fund to use on what would otherwise be "financial euthanasias." Taco Bell, of course, would later revert to more traditional advertising, including the use of a dog, who beginning in 1997, would proclaim his fondness for Taco Bell in Spanish. Bannerizer makes it easy for you to promote ClickBank products with banners, simply visit Bannerizer, and grab the banner codes for your favorite ClickBank products or use the Universal ClickBank Banner Rotator Tool to promote all of the ClickBank products.